Last night was a cold two-dog night. It was the unmistakable downward cadenza of the Satin Bower Bird that, through the slightly open bedroom window, told me not only had the day and I returned, but so had he. Hello, and did I tell you I missed you? 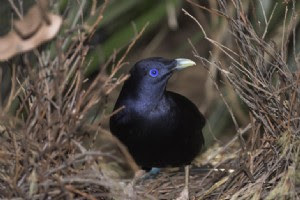 Moving in flocks, satin bower birds (Ptilonorhynchus violaceus) leave their dense forest homes in autumn to winter and feed in open woodlands. In spring, they return to the same territory year after year to nest and breed. This is the kind of signal of change, of a season, that the indigenous people have assimilated into their thinking about time and place, unlike the awkward and inappropriate four northern hemisphere seasons we have inherited and have yet to discard. Each male makes his own bower, a cathedral arch of delicate fine sticks and straws, decorated with forest treasures like flowers, feathers, and berries, with blue the most prized. The bower is perfectly aligned north south. With song and dance he entices the female into his archway, where she squats as his performance unfolds around her, his excitement increasing with flashes of purple blue feathers, wild violet eyes, and offers of gifts in his beak. After mating, the female moves away to nest alone leaving the male and his bridal bower for another. There are quite a few bowers around here. Whenever I stumble upon one I move on quickly. Years ago, when I first happened on one, it was photographed and boasted about to anyone who would listen. Later when I revisited to peer at it again, it had collapsed, with no sign of activity but only a sad little pile of twigs on the ground. It wasn’t mine to boast about, and I was embarrassed to have intruded into such a private place, and felt a strange silly guilt that I might even have taken his energy away with my image. He had taken his blue treasures though.